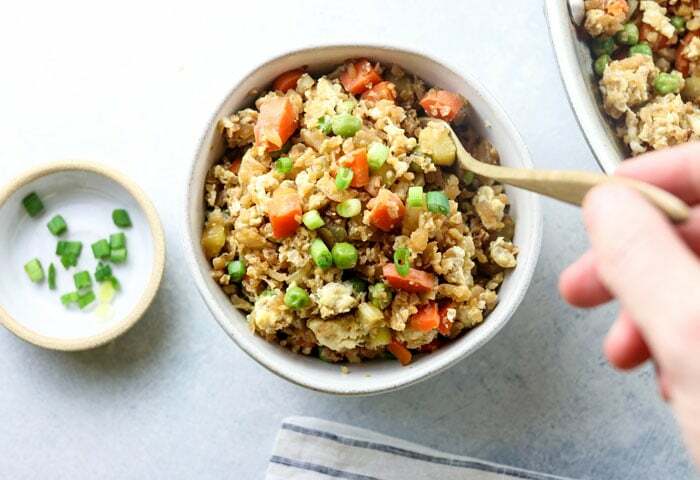 This Cauliflower Fried Rice is a delicious way to eat more vegetables and tastes remarkably like the popular take-out dish. You can serve it as a vegan stir-fry, or bulk it up with a protein, like eggs or chicken, to make it a Paleo and Whole30 compliant dish. 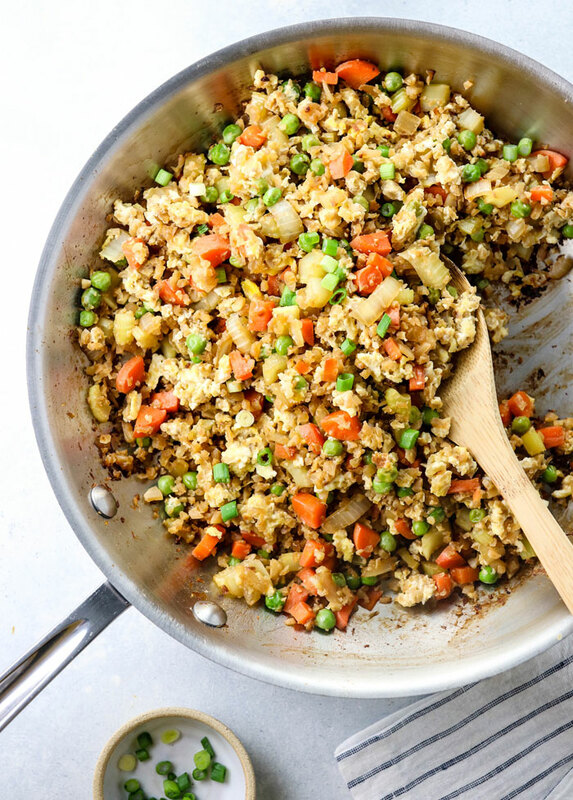 Cauliflower rice is low in carbohydrates and takes on the flavor of whatever you add to it. In this case, the tamari (which is just gluten-free soy sauce) completely masks the “cauliflower flavor” that some people aren’t a fan of…. like my husband. If my husband loves this dish, you’ll probably love this dish, too. Whether you typically like cauliflower or not! 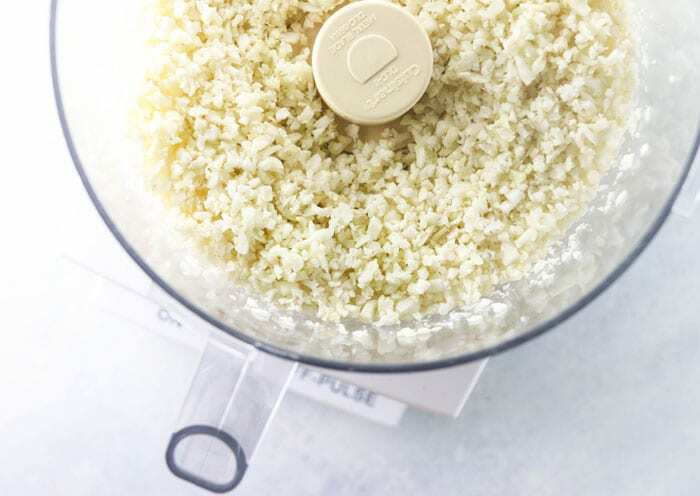 If you’re not familiar with cauliflower “rice,” it’s simply raw cauliflower that has been pulsed in a food processor to create a rice-like texture. No food processor? You can also grate the cauliflower using a box grater for a similar effect. Keep in mind that many stores now offer riced cauliflower in the fresh and frozen produce sections to help you save time and effort, too. If you need a vegan recipe, you can omit the eggs in this recipe and keep it totally plant-based. It’s a great way to eat a TON of veggies all at once! For more protein, feel free to add eggs or high-quality meat. This recipe is very adaptable. 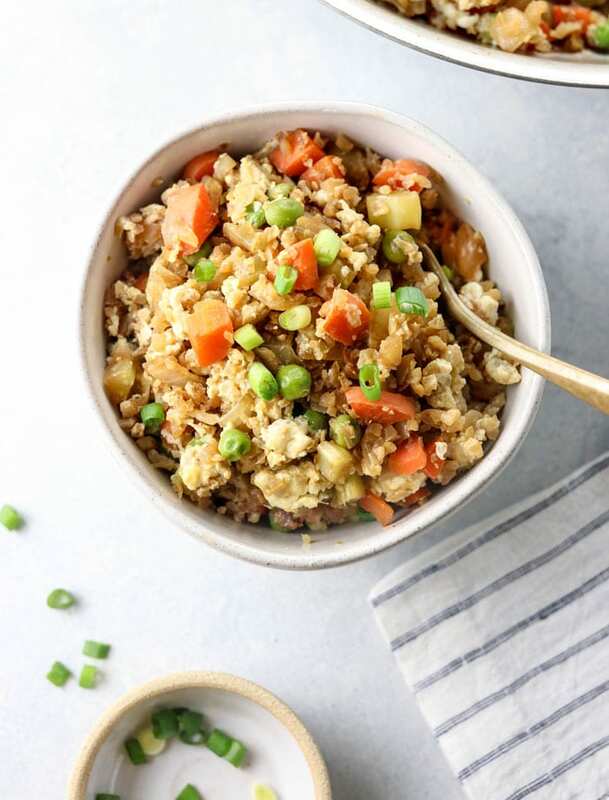 This cauliflower fried rice is a delicious way to eat more vegetables, made with cauliflower rice and gluten-free soy sauce. It's Vegan, Paleo, Keto, and Whole30 friendly! Heat the olive oil in a large deep skillet, and saute the onion, carrots, and celery until they start to soften, about 5 minutes. Add in the garlic and ginger, and stir one more minute, just until fragrant. Add in the peas and cauliflower rice, along with the tamari. Stir to combine, then cover with a lid to let the vegetables cook until tender, about 5 to 8 minutes. Stir occasionally to prevent sticking, and feel free to use a splash of water to remove any vegetables that stick to the bottom of the pan. To add the eggs, use a spatula to move the cooked fried rice to the edge of the pan, leaving a well in the middle. Add a splash more oil to the center of the pan and then crack the two eggs into the middle of the pan. When you see them start to cook, use a spatula to scramble them in the middle, until cooked through. Mix the eggs into the rest of the cooked fried rice, and adjust any seasoning to taste, adding more tamari if desired. Serve warm. Leftover rice can be stored in the fridge in an airtight container for up to 4 days. This recipe is easy to adapt to your tastes and preferences, too. If you're vegan, simply omit the egg and add some crumbled tofu, instead. Prefer other veggies? Feel free to use whatever you have on hand! I think broccoli, snap peas, and mung bean sprouts would be the perfect addition for next time. This recipe is totally adaptable, so feel free to taste as you go. As always, if you try something different please leave a comment below letting us know what worked for you. We can all benefit from your experience! Reader Feedback: What’s your favorite way to serve cauliflower rice? 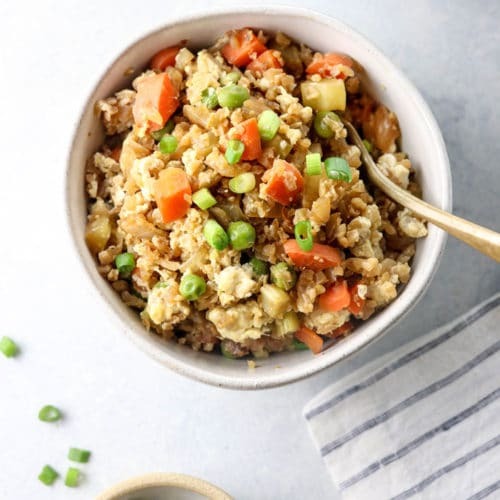 If you haven’t tried it yet, you should also try my Mexican Cauliflower Rice Casserole and my Cauliflower Rice Jambalaya. oops! My apologies! I must be over tired, LOL You do state an egg in the ingredients. I am vegan, would you know of a good egg substitute for this recipe?! correct me if I’m wrong but the ingredients don’t state egg. Yet the instructions call for an egg! Made this tonight and it was delicious! I added in some celery and used coconut aminos instead of the tamari sauce. I will definitely be making this again! Has anyone tried to freeze leftovers of this? Want to make a double batch and would love to know. Thanks! This recipe is so delicious I can’t believe it! I generally don’t eat cauliflower. I like the taste but it tends to be hard to digest. Until this recipe! I am shocked at how this tastes like authentic fried rice! I can’t wait to try all the other cauliflower recipes. I added some organic, nonGMO edamame. I’d add peas too since I’m Vegan and omitted the egg. DELICIOUS!! I used this in a burrito with black beans and my husband loved it! I enjoy your blog very much. I can understand why you are not a fan of Chinese food in the U.S. because it’s Americanized. We tried this recipe this weekend and loved it! I cannot believe it but I didn’t even realize that it was not rice, the texture and taste is identical to traditional fried rice. I used the food processor bowl on our Ninja blender which when pulsed a few times worked to make the raw cauliflower perfect “rice” consistency. We added sesame oil to add a nutty flavor, used butter instead of coconut oil and added peas. So delicious! Thank you for yet another wonderful healthy and delicious perfectly combined dish! This sounds so good! I don’t have a food processor (which I should, I know! ), but do you think the cauliflower would work in a blender? It’s not a Vitamix or a Blentec, just a regular, no-frills blender. Thanks for your recipes! Made the mac ‘n cheese last night, so good! So I’m starting the GAPS diet and rice is a main staple in our family so I thought I would give this a try. We were out of green onion 🙁 so I sub minced yellow onion. I also added the broccoli because your picture looks so delicious with it in it. THIS WAS SOOOO good! YUM! I LOVE your site! I discovered it about 2 weeks ago. I’m doing the GAPS diet and your recipes have been so helpful! I am wondering if you can use coconut aminos in this recipe or will it mess with the flavor? I made this tonight exactly as written and LOVED it! I have very picky boys and they both said it was better than regular fried rice. Who would have thought? I think your recipes are all delicious. Thank you so much for helping to make the world a healthier place. oh wow! I was very impressed at how the cauliflower didn’t even taste like cauliflower! Impressive! I am a RD and will refer my clients to this recipe! Awesome! Thank you! This was awesome! Can’t wait to have it again, and will try different veggies too. (This time it was snow peas chopped in the food processor, carrots and white onion as I didn’t have green.) I also used some toasted sesame oil for the flavor, though I know some cooks won’t want to add that. THIS WAS THE BEST RECIPE IVE EVER TAKEN OFF THE INTERNET!! I added more veggies and some siracha but the overall recipe was perfect!!! THANK YOU FOR HELPING ME CREATE MY NEW FAVORITE MEAL!! Is a Vitamix too powerful to make grated cauliflower? Absolutely delicious! So glad I found your site! wow it taste great. Prefer a little extra veg and something to spice it up, next time. THIS RECIPE IS AMAZING THANK YOU!!! I have been on a cleanse all week and this has been a delicious saving grace that cured my cravings for binging! I used Bragg Amino Acids instead of tamari – bc that’s all I had on hand and it’s great! Hello and THANK U!!! Just made this for dinner 2nite. OMG. This is fantastic! I have to say I’m in transition of eating healthier and ridding my body from grain slowly but surely due to allergic reactions I’ve started having. I have to say that this recipe has me over the moon pleased. Bonus – my vegetable hater little boy couldnt even tell he was eating cauliflower which he swears he hates I’ve been able to get him to eat broccoli and some green beans but that’s about it. He thought it was quinoa. lol. This has put a new light on everything! This IS highly addicting 4me. Luv it! I did a couple of cheats to this. I know should probably avoid the microwave a bit more, but by end of day I’m totally tired & thought this would be quicker. I did microwave this in 1 pyrex glass container and it worked great. I did use butter instead of coconut oil -so yummy (i’ll try coco oil next time) Instead of chopping garlic, again tiredness a factor, I used a lot of garlic powder. Other than that kept everything the same. I used the first pyrex glass to saute butter, green onions, and carrots. hmm. then put the cauliflower in my blender (which I love) and pulsed it to look like above pics. I then put the cauliflower into the glass pyrex with that already contained sauteed goodness, stirred in and set it for 2min. Dripped soy sauce to taste. Done & Done! I dont know how much time I saved, if any, but it sure felt fast (now that i think about it either way is probably just as fast). Just wanted everyone to know u can do this in a microwave with garlic powder if short on time or energy. I’m definitely making it again and will try the fresh sliced garlic -i love garlic- to see the difference. Thank you again! Oh and one more thing…I love your blog! I’ve read many health blogs yours tops them all! Never have i seen so much variety using easy to find and tasty ingredients! This will make my transition to a healthy grain free lifestyle and healthier diet for my boy much easier. Still smiling from the savory taste left from tonight’s dinner. Just awesome! So easy to make and soooo tasty! We def can’t taste the cauliflower, I love that ‘rice’ version a lot better. Thanks for sharing! This was fantastic!! Great recipe! I just tried this today. This was also my first time making cauliflower rice as well! An boy oh boy was it yummy! Cannot even tell it’s cauliflower instead of rice! I didn’t use the coconut oil, and added a few more veggies [used a broccoli with cauliflower and carrot mix]. Also used soy sauce instead of tamari. This is so quick and easy and to top it of so delicious! YOu asked what you should try next for a chinese night – Spaghetti squash lo mein – wow is that stuff good – I bake or boil the whole spaghetti squash until the inside falls in and the skin looks wrinkled – I cannot cut through an uncooked squash, they are just too hard. Once that is cooked and set aside to cool a bit before you cut it open to scoop the seeds out, mix up some julienned veges(green beans, carrots, mushrooms, snap peas, cabbage, zucchini, bamboo shoots, etc), bean sprouts, some cooked scrambled egg, slivered water chestnuts, lightly saute and swirl in some vege broth with cornstarch – if you want to use salt, ginger, or curry – feel free. It’s so yummy! I just found this recipe and tried it tonight with sprouted soy tofu, YUM! Your recipes are fantastic. I’ve tried to make raw cauliflower rice before and it turns out the trick is to lightly sautee it. I used Coconut Aminos instead of Tamari and added a few hot peppers from my garden. My husband couldn’t believe it was cauliflower. I haven’t had chinese food in so long because it’s always so oily and salty but this was amazing! I added extra broccoli, zucchini, celery and mushrooms in addition to the carrots, garlic and green onion.. wow. Seriously addictive. Hey! I’m just wondering if I could just use extra virgin olive oil instead of coconut oil, or does the coconut oil kind of give it that “Chinese food” flavor?? lol I just don’t have any coconut oil, but would LOVE to try this recipe out tonight! The main reason I cook with coconut oil is that it doesn’t mutate when heated, like other oils do. (Olive oil is better consumed over salads, rather than used for cooking.) If you have butter, that would be a great substitute, as it also doesn’t mutate with heat. The flavor shouldn’t be too affected by whatever you use, though! I’m going to try making your Cauliflower Fried Rice for dinner for the first time tonight and have a question. When you say two cups of cauliflower rice, I assume you mean raw cauliflower rice. I just wanted to make sure I wasn’t supposed to steam before frying. Thank you for some amazing recipes! Yes, I use raw cauliflower rice for frying– no need to steam it beforehand. Hope you enjoy it! Will the cauliflower process in a blendtec? Just made this tonight and it was a big hit. I actually couldn’t really tell a difference between this and real fried rice! I cannot wait to make this! This is a whole new lifestyle for me and it’s been hard to find things to eat besides salads, goat cheese, and green lemonade! 🙂 I’m thrilled I’ve found several recipes on your site I want to try. TY! Hope you like it! This is one of my favorite dinners lately! The egg is my favorite part of fried rice too! Same for pad thai. 😉 Shh. BRILLIANT! I love the use of cauliflower as rice. I have been pureeing it for awhile now as a mashed potato substitute. Now I can use it as a rice substitute. THANK YOU AGAIN! This is such a great idea!! I love the idea of using cauliflower as the rice since I’m not even a huge rice eater and it takes a while to cook anyway! I hear ya on Chinese food making you bloated – I’ve experienced the same thing way too many times. I recently did a makeover of Kung Pao Chicken and Sweet and Sour Chicken… maybe you could do Kung Pao or Sweet n Sour Tofu? Yes, cauliflower rice is WAY faster than the traditional stuff! I never would have thought to use cauliflower as rice! That’s fantastic. I am not a huge fan of Chinese food. I do love Italian though – hand me some pasta in a creamy sauce and I’m in heaven.